This is an easy chicken and dressing combination from Debbie. 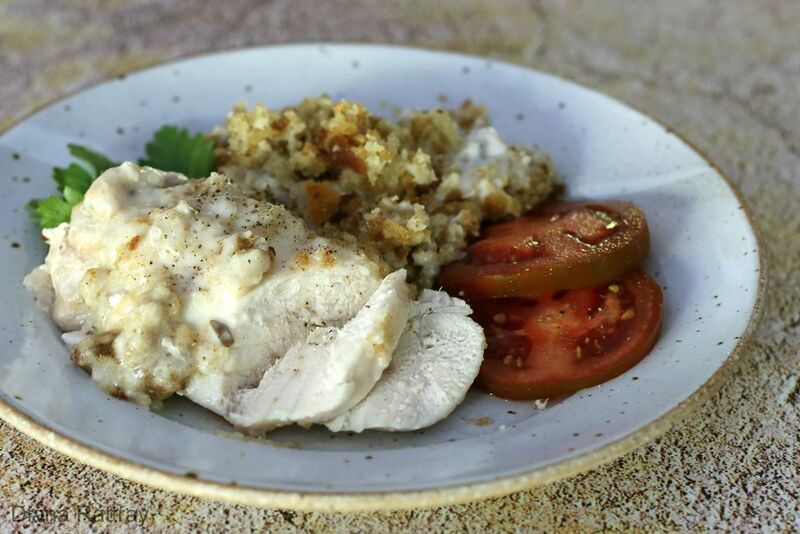 The chicken breasts are cooked with prepared herb-seasoned stuffing crumbs and optional sliced mushrooms. I like to serve this chicken with mashed potatoes and cranberry sauce. Add some steamed peas or broccoli for a hearty and satisfying meal. Prepare the packaged (or homemade) stuffing mix with butter and liquid as directed on package. Layer the prepared stuffing in the bottom of the greased slow cooker. Place the chicken pieces on top of the stuffing mixture. The chicken can overlap some, but try to arrange with as little overlap as possible. If there is room, you could use more chicken. Spoon the condensed cream of chicken soup over the chicken. You may also use cream of mushroom, or cream of celery, whatever you like. Top with the mushrooms. Be sure to stir the mushrooms around a little so they are coated with the soup. Chicken breasts tend to become dry over a long period of cooking, so check them early. Thighs are fattier than the chicken breasts, so they can be cooked for a longer period of time. Saute 1/4 cup of chopped celery and 1/4 cup of chopped onions; add to the stuffing mixture.